LONDON — Gone are the days of London’s "pea souper" smogs, but like many European cities, the British capital is once again being choked by pollution -- and has road traffic firmly in its sights. In 1952, the Great Smog suffocated London for five days, bringing the city to a standstill as soot-filled clouds descended onto the streets and into people’s lungs, leaving more than 12,000 dead. The crisis prompted a clampdown on the use of coal in the city – but decades on, pollution is still causing more than 9,000 premature deaths per year. This time, the key culprit is nitrogen dioxide (NO2), produced by cars and trucks -- and particularly diesel engines, which emit three times more NO2 than petrol vehicles. "Industry... is part of the problem, but the focus, the problem areas are next to roads," Gary Fuller, a senior lecturer in air quality measurement at King’s College London, said. London Mayor Sadiq Khan is on a personal mission to deal with the "lethal" air in the city, after blaming pollution for his adult-onset asthma. This week he announced plans for new charges for diesel cars and older petrol vehicles, which could see drivers pay £24 (US$30) a day to enter central London by 2019. But the issue is not just confined to the city centre, or indeed to the capital itself. "The NO2 limit value is exceeded in many major cities up and down the country," Fuller said. More than 40,000 British deaths a year are attributable to exposure to outdoor air pollution, according to a survey last year by the Royal College of Physicians and the Royal College of Paediatrics and Child Health. It warned that air pollution plays a role in many of the major health challenges of our day, linked to everything from asthma to cancer, obesity and even dementia. It can have a particularly damaging effect on children -- and many of London’s youngest residents are exposed, day after day, according to a new study by environmental NGO Greenpeace. The data suggests that more than 1,000 nurseries in England are located next to roads where pollution exceeds legal limits -- and another 1,000 schools and colleges. "Children are extremely vulnerable to its effects, and it can cause long-lasting health impacts and reduced lung function," said activist Anna Jones. Prime Minister Theresa May’s Conservative government is already under pressure over its response to deteriorating air quality. Last year, ministers lost a legal challenge at the High Court against their air quality action plan. New proposals are due by April 24. In February, Britain was also among five EU member countries warned by the European Commission to address repeated breaches of air pollution limits for nitrogen dioxide. Labour mayor Khan refuses to wait for the government to draw up its new action plan. "The air in London is lethal and I will not stand by and do nothing," he said this week. 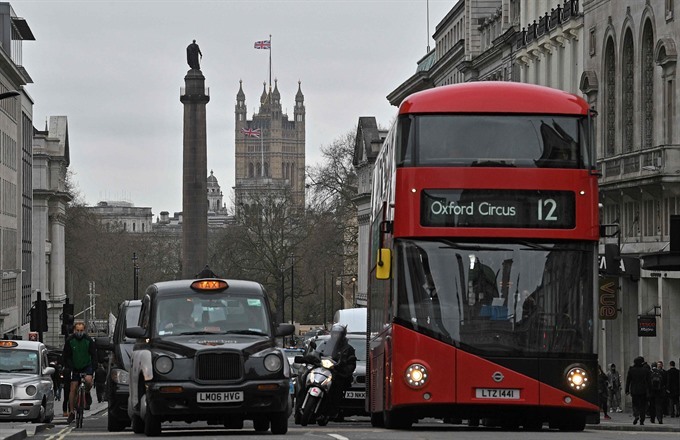 Khan has already promised to ease out of circulation diesel buses and taxis, and will in October introduce a new £10 daily "toxicity charge", or T-charge, for the worst polluting vehicles in central London. He has now announced plans for a new £12.50 charge by 2019 for diesel cars more than four years old and for petrol cars more than 13 years old. This is in addition to the £11.50 existing "congestion charge". Other major European cities are taking similar measures -- and Fuller, of King’s College London, said that aside from cutting pollution, there could be other beneficial side effects.